(Trent Nelson | Tribune file photo) Mia Love makes a statement at her election night party at the Hilton Garden Inn in Lehi on Wednesday Nov. 7, 2018. 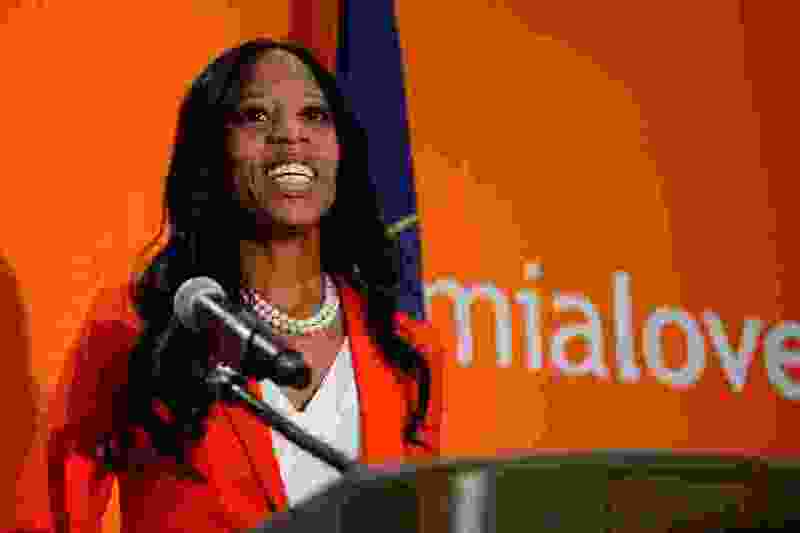 Rep. Mia Love, R-Utah, is suing Salt Lake County Clerk Sherrie Swensen, seeking to halt processing and counting of ballots until her campaign is granted the ability to oversee and challenge the effort in Utah’s closely watched and very tight 4th Congressional District election. In a lawsuit filed Wednesday in 3rd District Court, Love asks that her campaign be allowed to challenge the county’s verification of signatures on ballot envelopes, and seeks a judge’s order that those votes remain uncounted until those challenges are resolved. Judge James Gardner scheduled a hearing on the dispute for 2 p.m. Thursday afternoon in West Jordan, according to a court spokesman. The suit did not suspend ballot processing and counting Wednesday by the clerk’s office. In fact, election officials there put in extra hours counting votes before releasing an updated count at about 5 p.m. adding about 13,000 votes and whittling McAdams' lead by more than 350 votes. After Wednesday’s update, Love’s campaign manager Dave Hansen appeared more confident than at any point since polls closed Nov. 6. With the heavily Republican Utah County expected to update its count on Friday, McAdams precarious advantage of 0.36 percentage points is likely to change, and could potentially erode away entirely. Meanwhile, vote counting in Salt Lake County continues. "It’s business as usual, and what I mean by that is she [Swensen] is following the law and she continues to do her daily duties consistently and there’s no interruption of that,” County District Attorney Sim Gill said. Presumably, the clerk will continue the tally Thursday unless ordered by a judge to stand down. The motion argues the effort on behalf of the Love campaign is an attempt to interrupt the ballot counting process without providing evidence that Swensen hasn’t complied with Utah Election Code. Love, the only black Republican woman in the House, has been fighting to come from behind ever since election night. In a reverse of the Republican strategy in close Florida races for governor and U.S. Senate of trying to have the election-night leader declared the victor, the Love campaign is attempting to reverse McAdams' lead by the time the official vote canvass takes place. Also, unlike Florida, there has been no accusation of voter fraud in the Utah contest. A similar lawsuit was filed in New Mexico on Tuesday by losing Republican congressional candidate Yvette Herrell, seeking to have absentee ballots impounded so her campaign could inspect them, according to The Associated Press. In that case, the court challenge was filed after the county canvassing board certified Democrat Xochitl Torres Small as the winner. The Utah lawsuit notes that poll watchers have been allowed to observe the process of counting votes, but are not currently able to challenge the determinations of the clerk’s office staff. “A right of observation without a right of challenge, however, is a hollow right indeed,” the lawsuit states. In a prepared statement, Love’s attorney Robert Harrington said the lawsuit is not intended to accuse anyone of wrongdoing, but instead to improve the election process. Salt Lake County, where an estimated 85 percent of 4th District voters reside, has been McAdams' sole area of support in the four-county district. He is in his second term as mayor of the state’s most populous county. The Love campaign said it has not filed similar lawsuits in any of the other three counties in the district — the Republican strongholds of Utah, Juab and Sanpete counties. When The Tribune asked the campaign for an explanation why it only sued Salt Lake County, a spokeswoman said she would refer the question to its attorney, who did not return a call to the newspaper. Utah is dealing with a high volume of by-mail and provisional ballots this year, which delay the calculation of votes. Included in the processing of those ballots is verification of a voter’s signature against registration records, or the submission of affidavits in instances where a signature discrepancy is identified. The complaint asks for urgent action by the court, noting the Love campaign’s understanding that “all such ballots could be removed within the next 24 hours," which would eliminate the possibility of challenge. The suit was filed before noon on Wednesday and the hearing was scheduled for 2 p.m. Thursday. It is the second time Swensen, a Democrat, has been sued over this election. In the first complaint, filed days before the Nov. 6 election, Swensen’s Republican challenger Rozan Mitchell claimed many registered voters had not received their mail-in ballots. That lawsuit was promptly dismissed by a 3rd District judge on Nov. 5 for lack of evidence. Swensen went on to handily win re-election. Tribune reporters Bethany Rodgers and Taylor Stevens contributed to this report.